In the handling of magazines and television, there may be so many Kyoto features, and there may be few features of Shiga in neighboring prefectures. However, by means of SNS, cherry blossoms in Hikone Castle, Mitsuitsu Temple in Otsu, and Cherry blossoms along lake Biwa canal are introduced, and Shiga cherry blossoms are attracting worldwide attention as well as historic buildings. From Kyoto Station, we can arrive at Hikone Station in less than one hour by train. Hikone Castle towers on a small hill overlooking Lake Biwa. It is a famous castle that boasts a castle tower of national treasures, and is a major tourist attraction representing Shiga Prefecture. It is a very popular spot that is now attracting attention not only from Japan but from all over the world. Hikone Castle is visited by many tourists throughout the year, but it is the spring cherry blossom season that you can especially enjoy the beautiful scenery. The scenery where beautiful cherry blossoms color the historic buildings and stone walls is a beauty that truly symbolizes Japan's spring. The number of cherry blossoms that can be seen in Hikone Castle is a magnificent scale with about 1,100 trees centered on Somei Yoshino. Every year from the beginning of April to the middle of April, beautiful flowers bloom everywhere in the vast Hikone Castle. 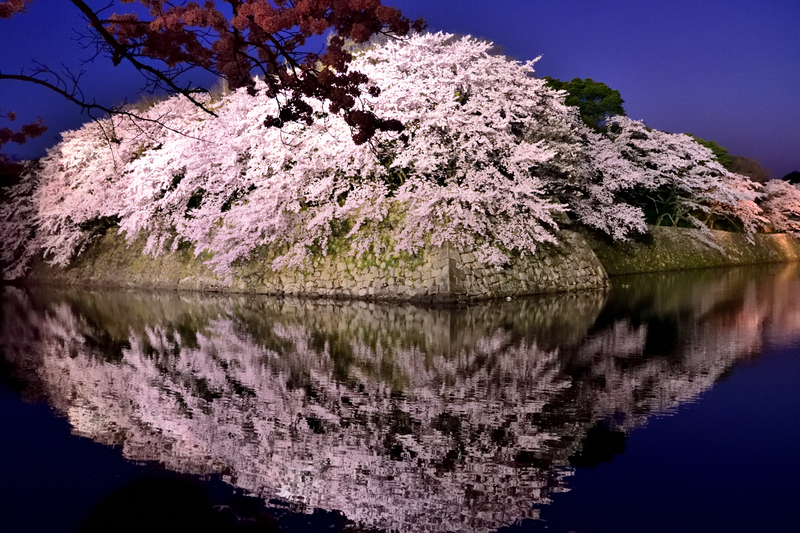 The cherry blossoms of Hikone Castle are a must-see for the reflection of the water in the moat. The sight of a massive stone wall and a light, gentle cherry blossom reflected in the symmetry attracts people who look at the beauty of the masterpiece. 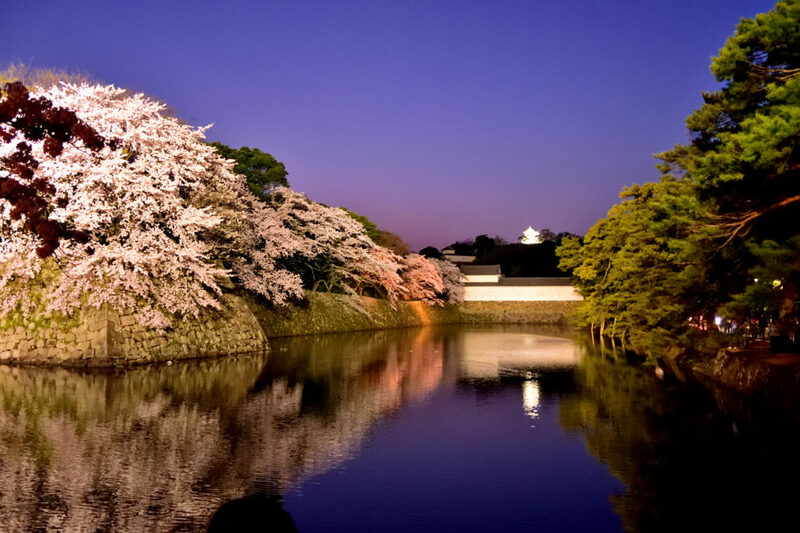 The contrast between the cherry blossoms projected on the surface of the moat and Hikone Castle gives a fantastic atmosphere. When the sun goes down, the darkness spreads and lights up gradually, and when the wind stops, the shape of cherry blossoms comes to the surface of the water. You will see the finest sights that do not differ from the rumor.